Signed with title and date on reverse. John Monks left the Royal College of Art in 1980 and has painted professionally ever since. His paintings are always atmospheric, the earlier works painted in his studio are mostly still life works. The exacting brush strokes are applied with ease and bravura, the surface scumbled and scraped until the precise stroke is achieved, this produces an energy rarely seen in any still life. 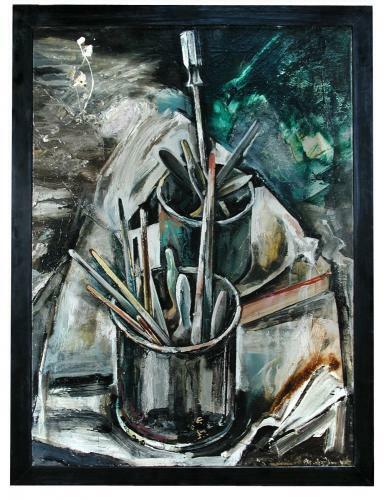 Monks' earlier works tend to be very large so it is very unusual to find an example of domestic size, this painting of tins and brushes is typical of his mid 1980's work, the palette of greens and creams with dramatic highlights painted tightly yet seeming effortless. MoMA New York, The Victoria & Albert London, Yale Centre for British Art, Arts Council Collection, York City Art Gallery, Manchester City Art Gallery, Unilever Collection.